YORBA LINDA, CA (March 1, 2010) — Chicagoland’s largest custom car show will feature Ashley Force Hood’s Ronald McDonald House Charity themed NHRA Mustang Funny Car. O’Reilly’s Auto Parts and South Oak Dodge will present the 48th Annual World of Wheels, March 5-7 2010, at the Donald E. Stephens Convention Center in Rosemont, Illinois. Force Hood’s Mustang will be on display as part of the Chicago BrushMaster Kustom Kulture Art Auction with all proceeds going to Ronald McDonald House Charities of Chicagoland and Northwest Indiana. Fans will be able to get their photo taken beside the Mustang throughout the weekend and get an up close look at one of the fastest race cars in motor sports. Ashley Force Hood campaigned the Ronald McDonald House Charities Mustang at two events (Seattle and Sonoma) during the 2009 Full Throttle Drag Racing Series. The attention the car generated for the Ronald McDonald House Charities is something Force Hood is proud to continue into 2010. “I was thrilled to be able to help raise awareness and donations for the Ronald McDonald House Charities in Seattle and Sonoma. BrandSource, one of our major sponsors, is very involved with this organization and their president Bob Lawrence, started talking with us about getting involved in early 2009. We got really excited about all the opportunities to help so this program came together very quickly,” said Force Hood. In just two previous World of Wheels Custom Car shows, the Chicago BrushMasters have raised over $110,000.00 for the charity. The Kustom Kulture Auction will feature the work of over 100 automotive artists from across the nation. Items auctioned off will include gold leaf lettered, pin-striped and air brushed pieces of Kustom Kulture Art and Automotive Memorabilia. Auctions will be conducted Friday at 7pm, Saturday at 4 pm and 7pm with a final auction held on Sunday at 4pm. Ronald McDonald himself will be appearing near the Ashley Force Hood Mustang display both Saturday and Sunday 4 pm to 5 pm. Fans are encouraged to come out and help support Ronald McDonald House Charities in building the world’s largest Ronald McDonald House at 211 E. Grand Ave. in Chicago. At 14 stories, and 86 rooms, it will help keep families together during their child’s time of medical crisis. The Donald E. Stephens Conventions Center is located at 5555 N. River Road in Rosemont, IL. Show Hours: Friday 3-10:30pm – Saturday 10am to 10:30pm and Sunday 10am to 7pm. Discount tickets can be purchased at any Chicagoland O’Reilly’s Auto Parts retailer. For more information call 708-361-2665. 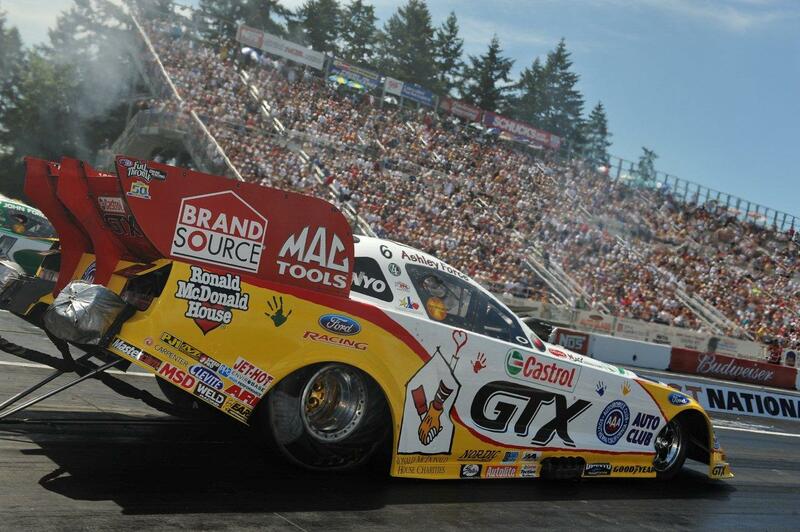 For additional informationa about John Force Racing contact Dave Densmore, 214-244-0008 or Elon Werner, 214-244-1184.